Avoiding Disaster: Cleaning Tips for Pet Owners - Sit. Stay. Forever. When you’re a pet owner, it can be difficult to find ways to keep your home as clean as you want it. Animals are wonderful companions who provide tons of entertainment and love, but they also require quite a bit of care, and when you lead a busy lifestyle, it can be hard to maintain the house in the way you’d like. 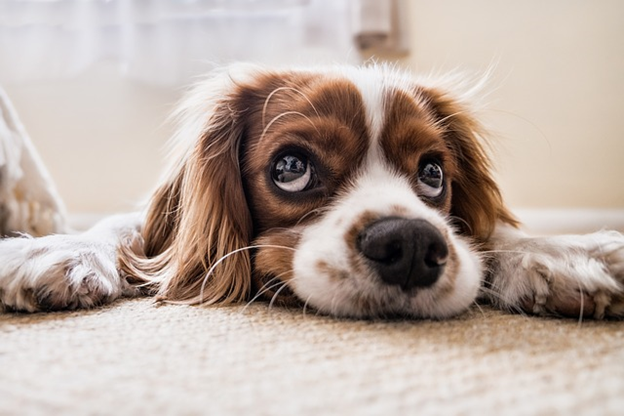 Pet hair and dander, damage to your carpet or blinds, stains, odors, and pet toys are just a few of the things you may be dealing with on a daily basis. Fortunately, there are several things you can do to ease the situation. From using eco-friendly cleaners to get those tough stains out of the carpet to setting up a baby gate to keep your pup from going into certain rooms, there are many ways you can keep your home clean that won’t break the bank. The key is to think about his needs and how to keep him comfortable and happy; often, this involves making sure he gets plenty of exercise so he’ll be too tired to get into trouble. Keep reading for some great tips on how to avoid disasters at home with your pets. The best way to prevent messes and accidents is to dog-proof your home to ensure he won’t go where he’s not wanted. Put up a baby gate at the stairs to prevent him from going up and down, close off rooms you don’t want him in, and keep dirty laundry off the floor, as it can promote chewing and accidents. It’s also important to make sure human food and treats are put up on a high pantry shelf; dogs have a very sensitive sense of smell and can sniff out just about anything. Natural cleaners are an inexpensive way to take care of stains and odors while making sure your home is safe for both you and your pet. You can use lemon juice, hot water, vinegar, and baking soda to clean just about anything, and these are great deodorizers as well. Not only do these inexpensive items help you clean without using harsh or potentially dangerous chemicals, but they are also often already found around the house. Many pets enjoy laying on the furniture; even those that have been trained not to will sometimes do so when their owners aren’t home. If your pet does this, simply lay an old towel or sheet on the furniture to protect it from scratches and fur. When company comes over, you can take the sheet off and throw it in the wash, exposing like-new chairs that won’t cover your guests in pet hair. You can also trim his nails regularly to prevent scratching. Pet toys often get overlooked when it comes to cleaning, but they can use some attention too. Take plastic or rubber toys and soak them in a mixture of hot water and dog shampoo. Your pet’s collar and any other accessories can also be cleaned regularly. You can also put certain kinds of toys in the dishwasher, but read the tags or directions carefully first. Keeping your home clean when you have pets can be a big job, but it doesn’t have to be overwhelming or expensive. Start by thinking about your pet’s needs and favorite places to visit in your home; this will give you a good idea of how to prevent messes and keep things neat and odor-free. With a good plan, you and your pet can coexist without stress, and you can make sure your home stays just as beautiful as you want.